Third Rock Adventures has been consistently providing excellent customer service ever since it started. A team of professionals who are extremely dedicated and passionate about the travel industry is the reason for all the accolades and recognition that we have been getting from various distinguished brands and forums. Mentioned below are a few of our recognitions and certificate of excellence. It’s celebration time at Third Rock Adventures! 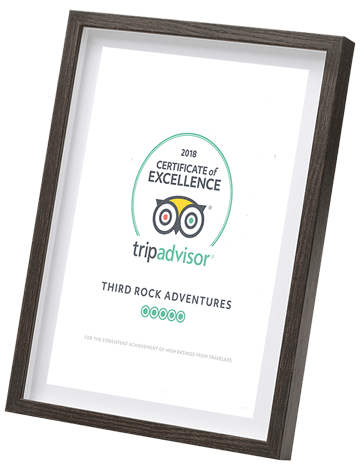 Yes, TRA has finally joined the reviewers’ hall of fame by receiving the coveted ‘Certificate of Excellence’ awarded by TripAdvisor (the site where travelers go for unbiased and honest reviews). We thank our valued clients for taking time out to post the positive reviews. Your positive feedbacks encourage us to strive for excellence. The effort put in by the TRA team is also commendable and they deserve a round a applause!